Originating from the Mexican wild turkey, the turkey was domesticated by Native Americans in prehistoric times and introduced to Europe by Spanish explorers in the 1500s. Early American settlers brought descendants of the Mexican wild turkey to the U.S. and crossed them with another subspecies of wild turkey indigenous to eastern North America to produce the forerunner of the modern domestic turkey. Turkeys are usually characterized by large tail feathers that spread into a fan when they are courting or alarmed. 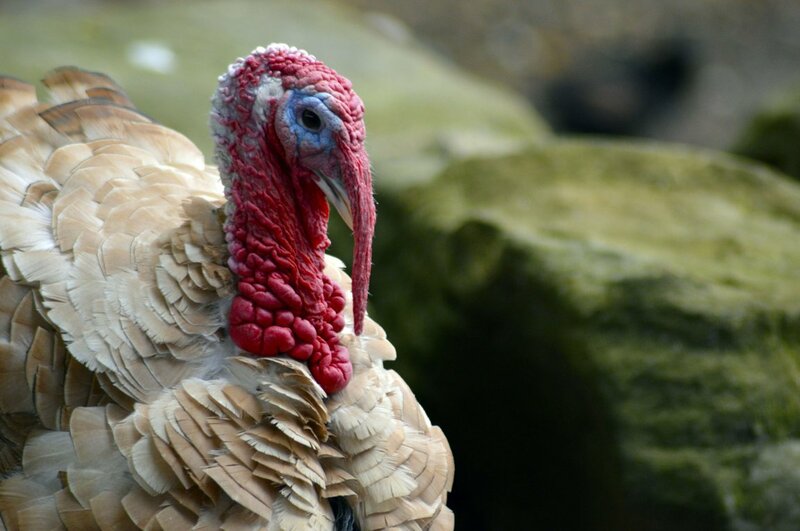 Turkeys also have several oddly named appendages: the caruncle, snood, wattle and beard. A caruncle is a red fleshy growth on the head and upper neck of the turkey. A snood is the red fleshy growth from the base of the beak which hangs over the side of the beak. A wattle is the red, loose appendage at the turkey's neck. A beard is the black lock of hairy feathers found on a male turkey's chest. Most turkeys raised for food have been genetically selected to have large breast meat, and they are unable to fly or reproduce without artificial insemination. They are fed a mix of corn and soybeans during their short life. Millions of turkeys are slaughtered for food each year, most at about 14–18 weeks of age. Commercial, domestic hens (or female turkeys) weigh 15–18 pounds by 14–16 weeks of age, and heavy toms (or male turkeys) weigh 25-32 pounds by 16–18 weeks. Five subspecies of wild turkeys still inhabit much of the United States, with a population estimated at 6.5 million. The most prevalent bird is the Eastern wild turkey, whose forest territory ranges from Maine to parts of Kansas and Oklahoma. Wild turkeys are smaller in size than their domestic counterparts, with a longer neck and body. They have a rich, brown-shaded plumage with a metallic or iridescent sheen, and white and black bars on their primary wing feathers. Toms can stand up to 4 feet tall and weigh more than 20 pounds, while hens are about half that size and weight. Wild turkeys eat nuts, greens, insects, seeds, and fruit, and can live 3–4 years. Their predators include human hunters and animals who disturb their nests, such as crows, raccoons, skunks, snakes and opossums. Hens begin nesting in late March or early April, laying one egg a day until the clutch reaches 10–12 eggs. They nest on the ground, in a hidden area in the forest or fields of tall grass. Incubation lasts for 28 days, and hatching occurs over a 24–36 hour period in late May or early June. Poults, or baby turkeys, stay near the nest until they are about 4 weeks old and can fly 25–50 feet. This allows them to escape predators by roosting in trees for the night, usually near their mother. By three months of age, turkey groups will begin to form a social hierarchy, and an established pecking order is set by five months of age, at which time groups show subdivision by gender. As full-grown adults, wild turkeys can fly at 55 mph and run at 25 mph. Hens are protective of their young. They will hiss and ruffle their feathers to scare away trespassers, and will only abandon the nest as a last option. Hatching begins with pipping, where the baby rotates inside the egg, breaking the shell in a circular pattern with its egg tooth (a sharp spike on its beak). Hens cluck as they check the eggs, beginning the critical imprinting process. Social cohesion among the babies is evident the first day after hatching, as is attachment to the mom. Vocal and visual signals are used to maintain close contact. This facilitates the learning of certain important activities, particularly feeding. Turkeys are social animals who prefer to live and feed together in flocks. Wild turkeys are not protected by legislation. Commercial turkeys are not even included in the Humane Methods of Slaughter Act, although poultry make up over 95% of the animals killed for food in America. They are raised in crowded factory farms where they are not able to nest or feed like their wild cousins.